Notice rédigée par Franck Cinato, 2012. Paris, Bibliothèque nationale de France, Latin 11641: Augustinus Hipponensis, Epistolae 27, 31, 24, 42, 45, 94, 260-261 (f.1-20) et Sermones 351, 392, 18, 87, 77, 127 (f. 21-63) (http://www.e-codices.unifr.ch/it/list/one/bnf/lat11641). Ringrose Jayne, Summary Catalogue of the Additional Medieval Manuscripts in Cambridge University Library acquired before 1940, Woodbridge, 2009, S. 45-7. Beschreibung von Cambridge. University Library, Ms. Additional 3479. Beschreibung der ursprünglichen Handschrift, die heute aus drei verschiedenen Teilen zusammengesetzt werden kann. 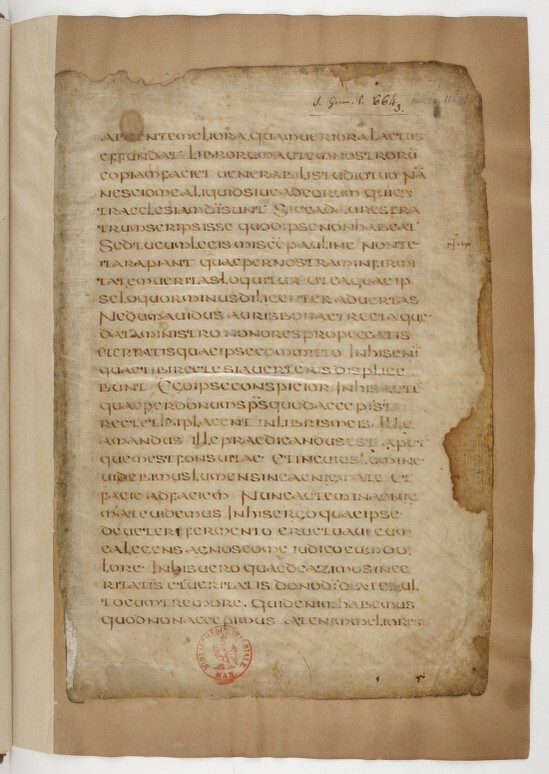 Ganz, David, "Texts and script in surviving manuscripts in the script of Luxueil", in: Irland and Europe in the early Middle Ages: texts and transmission, eds. P.N. Chatháin & M. Richter, Dublin, 2002, pp. 186-204.